It’s easy to write off the Internet of Things (IoT) as a great technology solution looking for a problem; yet another acronym clogging up the hype cycle. High-performance organizations, however, see IoT very differently. For them, IoT is already on the front line, where data and machine learning combine to power them exponentially ahead. When these organizations look at IoT, they don’t see a new technology to connect things. Instead, they see a business decision—and a better way to inform it. The rate of technological innovation continues to dramatically increase the power and miniaturization of mobile phones, computers, and sensors, putting ever smarter, cheaper, and faster services at our fingertips. For smart organizations, this opens up new opportunities to gather data more granularly in real time, putting it in the hands of decision-makers at all levels of the business. 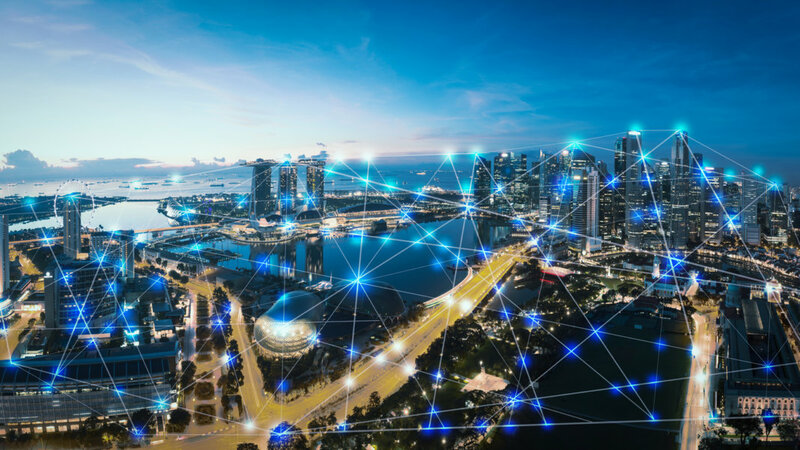 They know IoT is not just about connecting devices; it’s a tool to connect intelligence. This tool can be your business’s eyes, ears, and memory—one that never sleeps and never stops. Combining IoT devices and machine learning capabilities creates a nervous system for your organization, helping you learn how it operates and how customers interact with your products, then feeding in insights that allow you to make data-informed decisions. These decisions range from local and tactical—like when to restock shop shelves—to global and strategic, like continuing with a brand supplier or category. Businesses based around this sort of data-informed decision-making outperform and out-earn their competition. In short, if you’re not learning, then you’re missing out on earnings. Or worse still, you are investing valuable resources without a clear understanding of the outcome your investment yields. A healthy IoT nervous system fuels this learning and enables software to better fit with your business reality. In turn, this leads you to better business decisions, a more responsive organization, and higher performance. 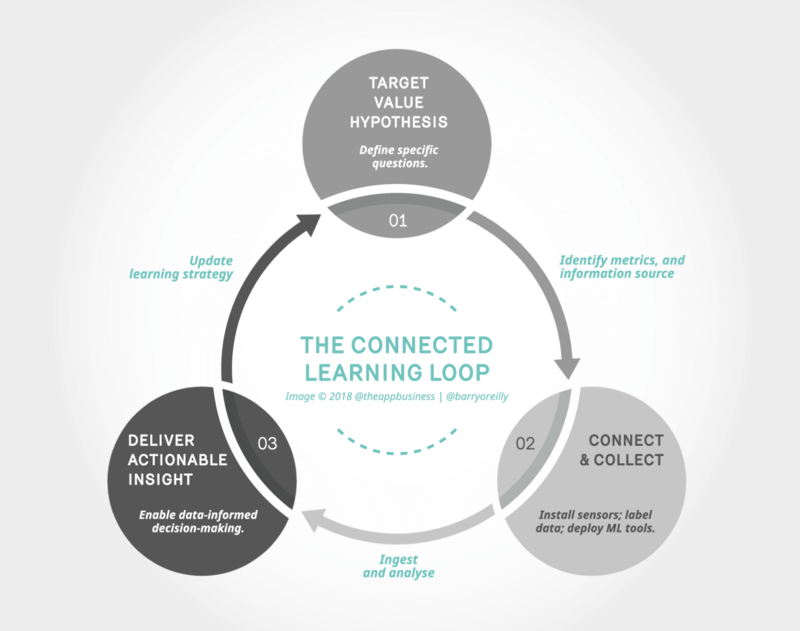 We developed a simple, three-stage model to help people think through how they might apply IoT to their own business: meet the Connected Learning Loop. What questions do we struggle to address as a business? Which indicators would help guide our thinking? Where is the richest source of insight? Who needs to know more, or is best positioned to act in response to this information if we had it? Answering these questions with the strengths of connected devices and machine learning capabilities in mind is the first step to a more responsive organization. Once we have defined a question to answer, it’s time to get started collecting data by connecting devices. This shouldn’t mean providing a mountain of raw data streams from exciting new sensors. Maintain your focus on the business questions you’ve identified, and ensure the data being ingested and analyzed is directed at the hypothesis you’re aiming to gather evidence for. Machine learning is the key enabler here, taking what might have been a previously unmanageable volume of data and processing it to be decision-ready. For example, these algorithms could turn a raw camera feed of a retail store—manuallly analyzed by people after the fact—into a responsive feed that includes live counting, path tracking, and group size monitoring of customers in a service environment. Once data is collected and processed as appropriate, it’s time to trial how well it can inform responses to our targeted value hypothesis. The most effective applications of collected data are uncovered by putting new information in the hands of those most able to act upon it. This means those on the front line of the business, active on the outer edges, can preempt issues, delight customers, or optimize daily operations in real time based on real evidence. This closes the Connected Learning Loop and feeds insight into additional value hypotheses to target. The most exciting thing about this approach is that it doesn’t take a multi-year, multi-million-dollar program to start realizing the benefits of IoT. Anyone, in any organization, can get started today. Together, Transport for London (TfL) and TAB sought to improve how efficiently the Underground network answered the question “is there a more efficient way to test the brakes on a Tube train?” Existing technology was cumbersome, expensive, and required trains to be removed from service for testing, resulting in costly disruption to the network. Over the course of just five days, a small team conducted a technical proof-of-concept that proved an iPad could be used to test the brakes of a Tube train as accurately (and much more cost-effectively) as existing brake testing technology. Over subsequent months, the product was developed and tested alongside the existing solution. The new tool, known as TfL Decelerator, is in the pilot phase. Across three lines alone, Decelerator is projected to save almost $500,000 per year. Scale that across the network, and the savings are considerable indeed. You don’t need a mountain of time or money to realize the benefits IoT has to offer. As projects like TfL Decelerator show, smartphones and tablets offer connectivity, light, audio, and motion sensors that can provide the minimum viable infrastructure for new insights right out of the box. All you need is a small and empowered cross-functional team. Give this team a clear question to tackle and get them to work through the Connected Learning Loop. Ensure they are feeding back lessons learned as they go, and use it to inform future actions. This lightweight, small-scale approach to real-world business challenges enables you to trial new innovations and gain the essential evidence you need to see if it’s worth scaling across your entire business. It’s time to get learning and start earning.